Beach towels are a facet of merchandise that kind of fascinates me, mostly because you just don't see them very often. I guess that's because people used them for their intended purpose, I remember my Wonder Woman and Star Wars towels were pretty much rags by the end. 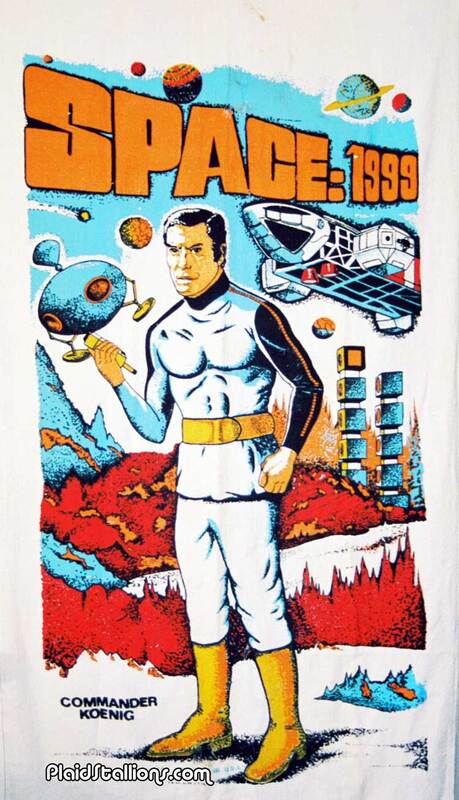 Seeing a strapping image of Martin Landau or the Eagle ship on a terry cloth background makes me want to hit Ebay. Trouble is, how the heck do i display them? I remember having a Hawaiian Punch beach towel back in the early 80s, and that thing got ratty pretty quickly too. Anybody else have any interesting towels? You know, to be a hoopy kinda guy. I also had a C3PO and R2-D2 face towel. Both of the above survived intact until the Great Cataclysm in 2005. As for how to display them, you either have them as wall hangings, or thumbtack them to the ceiling. I have a Spider-man vs Stegron towel very much like these from the late 70's. I haven't seen another one like it in ages.